Be sure to visit Monnit in Booth# 528 at Sensors Expo & Conference June 25-26, 2014 at the Donald E. Stephens Convention Center in Rosemont, Illinois. In an effort to consolidate their wireless humidity sensor offering, Monnit has discontinued lower accuracy sensors, making high accuracy humidity sensors the standard available product. All of Monnit’s wireless humidity sensors offer the same scientific grade quality and accuracy of the previous high accuracy humidity sensors at a new, lower price. Monnit wireless humidity sensors allow you to monitor relative humidity of air within a room or enclosure. They are ideal for monitoring humidity within greenhouses, industrial spaces, museums, saunas and humidors. They can also be used for residential applications such as controlling mold, mildew or dust mites. – +/- 1.8% accuracy (between 10% – 90% RH). – 0 to 100% RH operating range. This tech-tip is meant to give to give some suggestions for installing and using the new Monnit wireless control. For product documentation and additional help visitwww.monnit.com/support. Monnit Wireless Control allows a user to control either two separate 10-amp or two separate 30-amp relays, all through the iMonnit online sensors portal. Each of the unit’s two relays (controls) can be toggled on/off by a paired wireless sensor (currently over 40 types) on the same network, or directly by the user through the iMonnit.com web portal. • Choose “Manage” from the main navigation. • Select the network you would like to add the control unit to. • Find the bottom of the section “Sensor List / Assign Sensor”. • Enter the ID and Security Code from the back label of the control unit. Temperature Sensors Monitor temperatures in sample coolers and receive notifications if below or above a set threshold. Open / Closed Sensors Detect unauthorized access to lab and/or specific cabinets and areas. 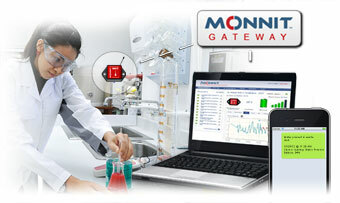 Protect Your Laboratory with Monnit Wireless Sensors!